Georgia’s PSC chairman says providing the energy needed to power a rapidly-growing state will require some tough decisions, as the major supplier of electricity looks at natural gas, coal and nuclear options. By law, the utility has to conduct Integrated Resource Planning – or IRP – for 20 years out and update the planning every three years. The PSC must approve plans and certify new electrical plants. 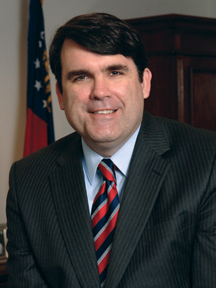 Eaton talked to Georgia Trend Editor Susan Percy in his office at the commission. Following are edited excerpts from the interview. GT: What exactly is the PSC’s role in providing for the state’s energy needs? Eaton: I view our role as really kind of a watchdog for the economy and future of Georgia. We have to make sure that we plan things out correctly as far as major capital expenditures. We have to plan for growth and capacity. We’ve had a heavy population growth. Our economy’s very healthy. An individual may not base a decision on whether to move to the state of Georgia on how much capacity we have or what our electrical prices are, but businesses do, especially manufacturing companies. Energy rivals labor as their highest cost. So it’s especially important that we remain competitive. GT: Is regulating energy costs a part of what you do? Eaton: We’ve got very important decisions to make here. We obviously have to make sure that the consumers get a very competitive electrical rate, but we can’t do it at such a low rate that it becomes a burden to business. There’s a real balance here that we have to strike. We have to concentrate on today and the future. GT: But you don’t regulate all utility companies in Georgia. Eaton: What we regulate are investor-owned utilities, so that would be – basically Georgia Power, AGL and Atmos Energy, a natural gas cooperative that operates in Hall County and the Columbus area. We wouldn’t regulate municipal electric, we wouldn’t regulate municipal gas, wouldn’t regulate EMCs [electric membership corporations], since those are owned by residents of the counties they serve. For the big companies, we obviously get involved in planning and the rates. On the gas side, now that you’ve had this extreme growth, especially in the northern area, you’ve had these areas that really weren’t served by any natural gas. It’s a little like the gold rush, where you’ve got municipals wanting to serve them because they can make money off of them, you’ve got Atlanta Gas wanting serve them. We’ve been getting involved in a lot of territorial disputes. GT: How do you operate? Eaton: We’re a quasi-judicial-legislative body. We have different requirements from the legislature. First and foremost, we have to adhere to the laws they pass. We also sit almost as judges, the five of us. When there is a rate case, it’s very much like a trial. You’re going to have utilities come forward – let’s say they want to raise our rates. You’re going to have interveners, going to have industrial users, going to have consumer groups, going to have the Consumer Utility Council, the state of Georgia’s own agency that represents the consumer. Within our organization, we’re going to have a consumer advocacy staff that puts up their case. And we bring in witnesses. The utilities, they’ll bring in their witness – a college professor from Duke, say, or some finance professor. They’ll say this is why a rate increase is justified. The other interveners bring in witnesses and say this is why it is not justified. Georgia Power or AGL will try to explain why it is just. This whole entire process goes on the record. Evidence is built. By statute, we are required to base our decision on the facts and evidence that are presented during that hearing. It’s more like a court proceeding. GT: When you are working with a company like Georgia Power – whether it’s a rate increase request, or reviewing a plan for future energy needs, is it an adversarial relationship? Eaton: Just the nature of it, being a judicial setting, a hearing, it’s adversarial in nature. You’re setting up two groups that sit on either side of the podium. That doesn’t mean there’s a knockdown, drag-out during the proceedings. Not only are we judge, we’re basically judge, jury and prosecutor when it comes to that. Obviously, Georgia Power knows they’ve got to provide a competitive rate to the consumer. There’s give and take. Many times there’s a consent agreement signed by all the parties – both sides try to work through their issue and come up with compromises. It really just depends on the case. GT: In terms of baseload generation needs for Georgia Power, what’s your role? Eaton: We have the IRP, the integrated resource planning. It’s a 20-year plan – every three years we adjust it. Georgia Power is coming in to give us their forecast, their needs for capacity. We’re discussing it with them. We’re making sure that we’re in line with that. Interveners can come in. What that helps us to do is plan. This goes 20 years out. These [baseload generation projects] are major, major projects that get put into the rate base and require a lot of planning. GT: What in particular will you be looking at this year? Eaton: There is going to be a need for a major amount of capacity in the year 2015. Basically we have got two possible – maybe three – forms of fuel that can produce that energy. We’ve got nuclear, coal and possibly natural gas. GT: Let’s talk about the three of them – starting with natural gas. Eaton: Natural gas probably has the least upfront risk – it’s the easiest to put in place right away. It’s the cheapest to build. It burns fairly clean, it doesn’t have a whole lot of impact on the environment. So you’re not putting near the capital cost in the rate base that you would with coal or nuclear. The major problem with natural gas, of course, is the variable cost of the fuel has gone through the roof, and I think it will continue to go to up. A lot of natural gas reserves here domestically are starting to deplete. We’re looking more and more toward LNG – liquefied natural gas, imported natural gas. That will continue to go up. I think the problem you will have is that more and more power companies and states become dependent on it. I don’t think we’ve built a single plant since 1991 that hasn’t been natural gas; and up to 2015 all the plants we’ll build will be natural gas. You worry from a fuel diversity standpoint. GT: What do you mean by fuel diversity? Eaton: I always liken it to a stock portfolio. You want to make sure you’re diversified. You don’t want to be too dependent on any one form of energy. For natural gas, it [the price] could just go through the roof. That’s an issue for becoming too dependent on natural gas. If that form of fuel continues to go up exponentially, our rates will go up. Eaton: With coal you’ve got quite a bit more capital costs that get amortized into the rate base over 30 or 40 years. Coal has historically been fairly cheap, but just recently the price of coal has gone up. China has put quite a bit of demand on the world market; we’re exporting more and more to China, so just from a pure known cost, coal is continuing to go up. The fuel to power up the rail cars to bring the coal in is continuing to go up. Of course, the scariest thing to me about coal is from the ratepayers’ standpoint. GT: And there are some environmental concerns with coal. Eaton: We have no idea what Congress is going to do as far as carbon constraints. Whether it’s a carbon tax, whether it’s a cap and trade, which essentially has the same effect as a tax, we don’t know what they’re going to do. For instance, we just passed a $300 million rate increase for Georgia Power; $200 million of it was environmental mandates. I’m not here to tell you whether I agree with these environmental mandates or not, but what gets lost a lot of time is – we might say we need to cut back on the emissions, we need to worry about the mercury. I think people lose sight of the fact that there’s a tremendous impact on the rates. Eaton: We basically have to allow Georgia Power “recovery” on everything that is prudent. If we rule it is imprudent, we don’t have to give them recovery, but obviously if it is mandated by an environmental agency, it is prudent. GT: Are you expecting more environmental mandates? Eaton: There’s been a lot of talk in Congress about all kinds of various emission restraints. I think with some certainty we can expect some carbon restraints. Some of the more extreme [estimates] could literally double our rates. So how do you plan for that, how do you quantify that? Here we are now, we’re having to plan for 2015. GT: What about nuclear power? Eaton: Nuclear is going to [have] the most upfront costs. It’s very cheap to operate, expensive to build – the exact opposite of natural gas. If nuclear is still the most expensive option, that’s not to say you cross it off. Nuclear is becoming less and less of the percentage of our overall energy pie here in Georgia, and you want to make sure that nuclear is part of the mix. Georgia has fairly cheap electricity, compared to the rest of country. Part of that reason is because of depreciated nuclear. GT: Nuclear has a downside, doesn’t it? Eaton: The 800-pound gorilla is waste. What do you do with the waste? You’ve got Yucca Mountain [proposed nuclear waste site in Nevada] sitting empty now. It’s a real shame because the states are on a huge hook. We’ve all contributed to building that out, hundreds of million of dollars. GT: What about the safety factor in nuclear? Eaton: There are plenty of other countries like France, which tends to be a fairly liberal country. They are 75 or 80 percent dependent on nuclear; they are very pro-nuclear. I don’t believe there have been any issues there. There is a risk to [nuclear], but I think it’s a lot more slight than what the perception is. GT: Still, some people find nuclear scary. Eaton: This is somewhat anecdotal, but here in Georgia when I’m out traveling the state, the majority of people appear to be pro-nuclear to me. I think a lot of people realize there are pros and cons for each form of energy. Nuclear gives us independence. It’s obviously the cleanest burning form out there, doesn’t produce any emissions in the environment. GT: There are a number of nuclear power plants being built in other parts of the world. Eaton: There’s going to be a lot of demand from China. If we lose our spot in line on nuclear, there will be plenty of other states and countries across the world that will happily take it. I’m all for clean air, all for the environment, but if you continue to get ultra-extreme with this, all these environmental controls go into the rate base so the rate base continues to go up. You become less competitive for business and that forces businesses, say, to move to a lower-cost country such as China. All of a sudden you are in another country producing your product with wide-open energy and no environmental constraints. GT: Do you have concerns about nuclear? Eaton: One thing that probably gives me quite a bit of stress is the huge cost overruns [when Georgia Power] built Plant Vogtle [in the 1980s]. It’s all upfront costs; and if we do go down the road of nuclear, cost containment is going to be a very important thing to me. GT: How do you guard against overruns? Eaton: A number of things have changed. There are a lot of differences now than when [Vogtle] was originally built, [reasons] why what happened then shouldn’t occur today. Part of the problem was it was being built during [the time of] Three-Mile Island, so you’d literally get done with a whole section and they [the government] would come out with some new regulation; so you had to dig it up and redo it, because they were constantly changing. Another thing that was different back then is that all the reactors were basically custom, where now they are a lot more standardized. It’s been done over and over again and people know what they’re getting into. We also have as part of the process, there’s going to be a six-month review. We’re going to be reviewing the progress of that plan, making sure things are in line with the forecast, making sure that costs don’t get out of control. GT: Once you have the updated plan from Georgia Power, what happens next? Eaton: We’ve got independent evaluators, we’ve got staff looking at it. Yes, there will be hearings, there will be interveners, there will be people to discuss the pros and cons of all of it. There will be environmentalists to come. There will be pro-nuclear people to come, there will be anti-nuclear people to come. There will be exciting hearings.